Graceful, charmingly beautiful flowers of an iris differ in a big variety of forms, coloring and shades, and thus many of them are fragrant. Blossoming of irises is transient but if you put different types and grades, the term of blossoming will significantly increase. 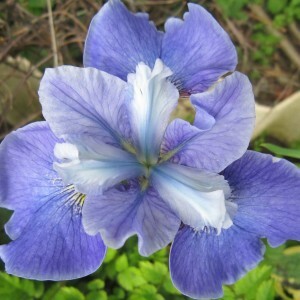 Some irises can repeatedly blossom in the fall. This unpretentious, perennial grassy plant. Its linear radical leaves are located a fan in one plane and densely pressed to each other. Each fan bunch of leaves includes from 6 to 12 leaves. Length of leaves depends on a type of an iris and varies from 5 cm to 2 meters. On average at a garden iris length of leaves reaches 10-110 cm. Color of leaves changes from light green at the beginning of vegetation, to dark green with bluish outflow, by the time of blossoming. Leaves very rigid and strong, also don't lose the decorative effect during the whole season.